I'm just starting and have no kids. How do I get parents interested in placing their kids with me? I need to come up with a strategy for finding parents that will trust me with their kids. I don't have any right now except for my son. What kinds of incentives should I offer to parents to get them interested and feel comfortable with me. I'm feeling desperate. What can I do? Please help!! You have hit on a great question, one that everyone has to face when they start. When you begin, you basically rely on your past experiences that might relate, like your love of children and in your case, your own child. Maybe experience as a babysitter, watching kids at church, or some volunteer work that involved kids. Take a look at my page Child Care Qualifications. Read through this page and relate it to your current knowledge of raising your child. 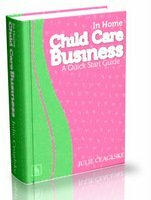 Then you need lots more information on how to become a preferred child care provider, advertise for free, make ads, where to post them, what to say to parents, how to interview them, set up your home, etc ALL of this in in my book In Home Child Care Business. A Quick Start Guide! This is the best economical investment you will make just starting out! Comments for I'm just starting and have no kids. How do I get parents interested in placing their kids with me? Your book got me started!!! !